We just added some beautiful neutral pillows to the shop! We added a bunch more of the fan-favorite mudcloth designs as well as some vintage indigo. Swing by or stop by our online shop and check them out! Our Global Collection is here! It's full of, as the name suggests, globally sourced fabric and fresh colors. We wanted to be sure and make something cohesive where mixing and matching is encouraged. There's some black and white, some blues and a great pop of rust. Be sure to check them out in the shop! 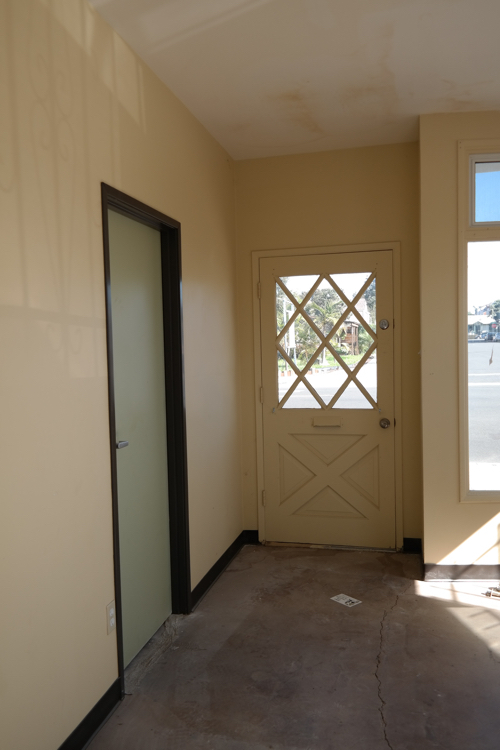 I thought it would be fun to share the transformation I made to my design studio/retail space here Carlsbad, California. I wanted to create a refined and modern California-inspired space with a Bohemian vibe. Since I'm a hop from the beach and situated close to the downtown Carlsbad area, I wanted a bright and inspiring space that would continue to inspire me every day - and reflect the laid back vibe of the surrounding beach town. When I rented this space, it came along with a green and yellow paint combination, varying in shade from wall to wall. The black rubber baseboards weren't doing anyone any good so those also had to take a hike. I originally considered polishing the concrete floor but the crack in the middle was too severe and I later decided on a warmer vibe and overall feel. I decided to go with a laminate floor that would be scratch resistant and weather any foot traffic for years to come. I love this space. I'll take you through a before & after of the design library and bathroom I remodeled in the back area as well soon! Most of the merchandise pictured is for sale under the "SHOP" section of my website. If it's not there and you're interested, just shoot us an e-mail! New and exciting changes at Studio Matsalla! For many of you this is old news so I apologize for any redundancy. I've been documenting the opening of my design studio and boutique in Carlsbad, CA via Instagram in great detail. This was a huge step in my career and lifelong dream fulfilled. Check! I've had so much fun transforming this tiny retail space into a working office and source of inspiration for myself, my clients and new customers. The story is simple. I've been romanticizing the idea of having a boutique most of my adult life. It's been one of those pipe dreams that never seemed to come close to fruition. This past year, my design business really started to flourish and my husband and I were working out of the same home office. He is a programmer and I'm a loud creative type. You can only picture how lovely that scenario was on a daily basis. He needed a quiet and peaceful environment to focus and I needed to meet with clients, call vendors and talk to him about every thing I ate 15 minutes ago. It was time to think about working elsewhere. So there I was one morning, on my way to ship a rug to a customer at the post office when I noticed a quaint and tiny retail front available for lease. I called the number on the sign and drove past the shop 40 times before signing the lease. You know, normal crazy-person behavior. The rest is history. This new space serves as a creative studio space, where I work tirelessly to create beautiful and inspiring spaces for my clients. It also serves as a boutique where I share my passion for one-of-a kind and globally sourced home decor. All of my merchandise has a heart and soul and a story. For those of you not local to Carlsbad, we'll be uploading much of our merchandise to our online shop, accessible at your fingertips. I hope you continue to follow along on my journey, pop into my boutique...or just stop by to say hello. I promise to share the before & after transformation photos soon.